If﻿ you c﻿rouch but straighten your legs, then you're doing the same thing as him, especially if you're slowing the wheel. Pe﻿rsonally, 100% of the times I crouch I have rider induced wobbles. When I state ‘crouch’ I am referring to flexing my knees and hips into semi sitting position. My center of gravity is then lower to the ground while I simultaneously shift my weight to the heels resulting in a rapid loss of kinetic energy that halts the wobble almost instantly. This method works for me as I’m much more cognizant of the onset of a death wobble following my accident. I do hate wobbles! since﻿﻿ the ol﻿d la﻿dy was killed. Unfortunately I missed something. Was there a story posted about this accident? The following article was just published in the Irish Times that appears governmental support for PEVs might me growing in that country. I only noticed the hit when the video was in slow motion, which says a lot about the energies involved. When these wheels let go of you at 25 mph there's just not much energy in them. It's like being hit by a small dead wet cat; there's no energy to speak of. That shouldn't surprise anyone, because the rider, comprising the majority of mass, has long since exited the play in a bloody heap. By contrast, eScooter collision inevitably take the rider down with the sinking ship, because most people's instinct isn't bailing but gripping the bars tighter. We're the cockroaches of the PEV world, because we bailed so often learning our wheels. 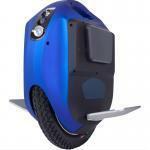 When these wheels let go of you at 25 mph there's just not much energy in them. Even in the full speed vid. you can tell the rider in front got struck, just watch his reaction. The reason the contact is not obvious is because it was not a direct hit. The run away wheel struck the back of his wheel with a glancing blow; it barely transmitted any energy to the impact before continuing to veer off to the left (that's why it continued at speed towards the fence a full 20 feet further away, and still struck it with force ). Also the struck rider is riding an EUC which will automatically respond to the input. This input was a slight nudge forward. Nothing more that what it would feel going over a bump. You can't change the laws of physics. 40lbs moving at 25mph is 40lbs moving at 25mph, whether its a wheel, a bowling ball or a bag of bricks. I agree with this statement. 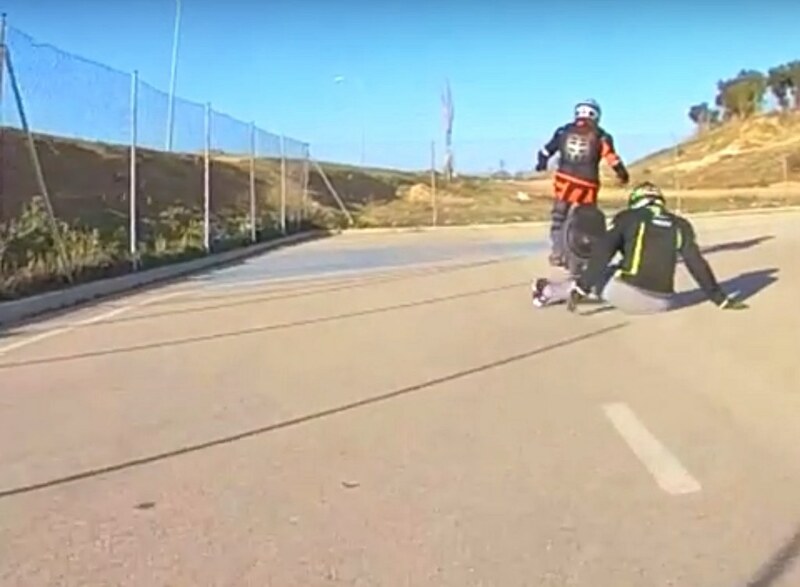 MY point in referring to the Spanish escooter death was to point out that when a by-stander gets injured by an unregulated technology (no matter the exact breakdown of the accident) authorities react by banning and restricting. If that Spanish old lady had been struck dead-on in the back of the legs by 40lbs of bouncing EUC at 25mph, she may not have died but she would have been injured. She died by striking her head on the ground; you don't need an escooter with riders to knock a frail old person over causing them to strike their head on the ground; the ground is present in every scenario, escooter or not. In England a few years back we had an unusual series of "sucker-punch" deaths. People in public getting punched in the face, falling, striking their head on the curb/ground, and dying from the impact. No other force or mass required than a punch to the face and gravity. "Two men were sharing a scooter when they smashed into the woman, who hit her head on the ground and died of her injuries in hospital a few days later. The pair are facing trial for manslaughter. " If your wheel kills someone, you could face manslaughter charges !!!! BTW All those "sucker-punch" perpetrators were up on manslaughter charges (the ones that were caught). And an obvious extension of that; if you live in a litigious society, even a basic injury could have you facing a civil law suit for damages, medical bills, mental anguish, time off work compensation, etc, etc. And any typical jury is going to be on the side of the innocent member of public (more like them) and not you; the guy riding his expensive rich-boy's toy recklessly (which is how the prosecution will frame it). In a regulated vehicle you are cushioned financially from an event like this by your vehicle insurance, EUC? not so much. I could not capture the exact moment of impact but if you view the series photos you can see that the posture of the rider in front abducting his arms to almost 45 degrees with his palms facing upwards. Then there is the reactionary backward shift of his torso, a 25 degree CW turn of his head and the exaggerated flexion of his right knee coinciding with an immediate tilt of the Z’s body from right to left. In my mind there is satisfactory evidence that contact occurred. Haha! I don't think I deserve such an honor for so little! The sound level of the alarm is obviously not doubled, but definitely stronger than before. I just ordered the exact same beeper, and did this mod to my ACM2, but when I close the side panel, the beep appears to be the same volume, if not quieter! I can barely hear the top speed beeps even with a non-full face helmet. It only sounds louder with the side panel open. Could it be some sort of destructive interference going on inside the cavity? I didn’t want to have to mount the beeper outside the shell, but that may just be my next step. When ive felt the onset of a wobble, i pretty much immediately relax my legs and kinda...break check? Almost like i lean back like "Jesus take the wheel". I believe the correct response when there is a wobble of any sort is to immediately brake as hard as you can, within reason of course. This is the opposite immediate response on a motorcycle, the difference coming from the increase of rake when braking on an EUC while motorcycles decrease their rake under braking. Even if braking doesn't ultimately get rid of the wobbles, at the least it'll reduce your speed so the crash won't be as bad. Modern EUCs of any size can brake amazingly well, as good and maybe better than bicycles, and a slide out and crash from leaning back is probably a great and safe way to crash compared to a typical bike front flip. I hope the z10 rider is okay. The wobbles started as he exited the turn. Maybe people had luck correctly wheel wobbles with increased speed but i don't think it helped in this situation. The rider also oversteered prior to the last final which leads me to believe that he's not that experienced corning at higher speeds? His body seems extremely stiff the entire time and his arm placements .....i would never keep my arms in front a la t-rex / zombie style. It's too hard to counter balance with your arms positioned that way. No other force or mass required than a punch to the face and gravity. We can kind-of have to guess that something else must be going on, as even old people very rarely die from a stumble fall. In case of the punch, the person may be unconscious already before the impact, which makes matters much, much worse as the head protecting reflexes are missing. A scooter impact introduces energy such that a person may not just fall down but may be thrown to the ground or onto a curb which easily worsens the impact. Oh yes, I would imagine some of them were unconscious, but even conscious, if your head falls towards a higher surface, such as the curb from the road your head will strike the curb before your body has come to a complete stop. The point I was making is that the initial impact: fist, escooter, EUC, bicycle, doesn't have to be that serious, if it sets up a chain of events that leads to something else, more serious. It could be a struck head, a swerving vehicle, stepping/falling into traffic. "Last month a 40-year-old woman was killed in Sabadell, near Barcelona, when she fell off the electric scooter she was using and was run over by a truck." Now this is a self inflicted death, but you see how something minor (a fall) can lead to something bigger (run over by truck). An English boy was squashed by a bus last year when he fell off his hoverboard. If we cause someone to fall or suddenly change path into danger, then any further consequences resulting from the fall, etc are our responsibility. Sorry to hear this, in my case the addition of the beeper certainly produced a stronger sound. Or maybe just replace the factory beeper with a known louder(more efficient) one. I bought such a thing for a few bucks to add audible turn signals to a motorcycle I was restoring. Worked well. By adding one to the existing, impedences or voltages/amps, etc might be changing undesirably. After all if you add another speaker to a 5W radio, the radio is still only going to put out 5W, it's just doing it through 2 speakers. 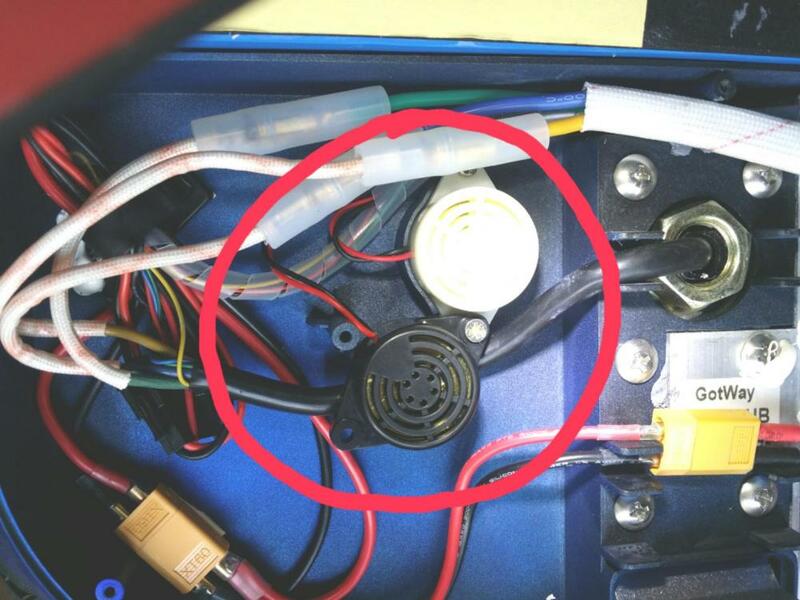 It al depends ou how you wire the second beeper (seriel vs parallel) and the impedence of the new beeper. One can play around with impedence to reduce back pressure (8 Ohms vs 4 Ohms, vs 2 Ohms etc) but the amp output if finite. I just ordered the exact same beeper, and did this mod to my ACM2, but when I close the side panel, the beep appears to be the same volume, if not quieter! It might be possible that the new beeper is out-of-phase with the original, which would indeed do it’s best to cancel out the original beeper. There is no solid standard for speaker polarity, and while a beeper is not an actual speaker, I wouldn’t be surprised if they shared the issue. I would try to swap the red and black wire for the new beeper. No harm done trying. I’m not very familiar with piezo beepers, but in my understanding their initial impedance is zero, as is with a piezo pickup. Under action though, I have no idea. Or how the series/parallel connection would affect. Thanks for the replies, I’ll try what’s been suggested (swap polarity, maybe try series instead of parallel, etc). It would be terrible if a pedestrian became seriously injured from an EUC mishap. Unfortunately, given the odds, it is going to happen someday. @Jean Dublin why are the Dublin police harassing you guys? I just explained on the General Discussion, with a video of how it happens. Or maybe just replace the factory beeper with a known louder(more efficient) one. Its the same amplifier circuit, so it won't be louder unless the speaker is more efficient as Smoother said. You might notice more bass ... if you have sensitive ears. A 4-ohm speaker requires more power from an amplifier than an 8-ohm speaker to produce the same loudness of sound. This is due to the relationship between voltage, current and resistance in electronic circuits; for a given voltage, a lower impedance means a greater current. Power is a combination of voltage and current, so to provide more current to the speaker, an amplifier must have a higher power rating. Speaker elements connected in parallel indeed decreases the impedance, just like when connecting two resistors in parallel. 8 & 8 = 4, following the formula: (r1 * r2) / (r1 + r2). While this draws more power from the amplifier, doubling the speaker cone area in turn acoustically increases the Sound Pressure Level by 6dB. Therefore what happens to the sum SPL depends on the impedance power curve or efficiency curve of the amplifier. In most situations the SPL will increase. For example, it is typical for a solid state amp to put out 50W to 8Ω, 100W to 4Ω, but only 120W to 2Ω. (Although, many tube amps behave differently than a solid state ones in this regard). Now, as I was slightly embarrassed that I didn't know more about the electrical behaviour of a piezo buzzer, I did some reading. Piezo buzzers are not speaker elements. They don't have a coil in them, or any other direct electrical contact between the + and - terminals. Therefore they (and their driving circuits) behave differently than speaker elements regarding connecting them in series or parallel. A piezo buzzer is actually like a capacitor. Calculating the total value for two capacitors in series or parallel are calculated opposite to resistors, so connecting the elements in series will now follow the formula above. But, this will only give us the capacitance of the piezo buzzer, it will not tell us it's efficiency. A typical DC resistance for a speaker element is 4 ohms, while for a piezo buzzer it is 20 000 000 ohms. To make things more complicated there are a few different types of buzzers, which are of course driven differently. But I'm pretty sure the beepers in EUCs are indeed piezoelectric buzzers. That said, piezo buzzers are hardly ever connected in pairs, so I wasn't able to learn how they would typically behave. I don't have the skills to learn that from the driving circuit schematics. try what’s been suggested (swap polarity, maybe try series instead of parallel, etc). Thanks for the explanation. Nothing happens when you connect them in reverse, as they weren’t designed to handle reverse DC voltage. I’ve yet to try changing them to series as I’ve been busy. One idea I had was keeping them parallel but adding a resistor with a small value in series with one of them to drop the voltage and thus change the pitch slightly (as a lower voltage input will give a higher pitch with these variable input buzzers). Which would have the effect of each buzzer making a slightly different frequency, which would hopefully be picked up by the ear better and eliminate the possibility of destructive inference inside the shell cavity. I take it you tried this already? That tells us that they are active buzzer with an integrated driver circuit. A simple piezo buzzer element requires AC to vibrate and make sound. I would suspect that connecting the units in series will lower the output volume even further, since it will probably halve the voltage available for each unit. Have you considered installing the buzzer (the original or the additional one) pointing upwards? My plan is to move the original buzzer to underneath the power button, pointing upwards. I expect it to be much easier to hear at speed. That tells us that they are active buzzer with an integrated driver circuit. Oh yeah there is a circuit board of sorts inside. My ks14c buzzer failed in the first month. Once the replacement arrived I dismantled the bad one to have a look around, as you do. Nothing to fix but circuit board found. I still have it somewhere, God knows why.